Playa La Bonita - Las Terrenas, view of Playa La Bonita. Las Terrenas: Playa La Bonita, 0 mi. Las Terrenas: Livestream El Paseo Shopping Center, 1.9 mi. 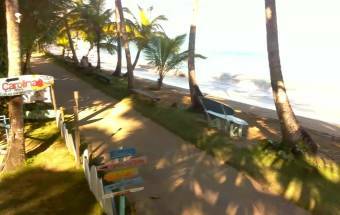 Las Terrenas: Livestream Punta Popi Beach, 2.4 mi. Carnival Sunshine: View from the Bridge, 20.5 mi. Santo Domingo: Parque Colón, 61.6 mi. Cabarete: Beach View, 62.7 mi. Cabarete: Livestream Beach, 63.2 mi. Cabarete: HD Stream Kite Beach, 63.8 mi. This webcam Las Terrenas with the theme Seaview was added on April 27, 2017 and is operated by Skyline Webcams. It got 2748 visitors since then. Shouldn't this webcam work or should the link be wrong please report that here. You can add this webcam here to myCams.